The first hole that we will talk about his the 7th hole of a nearby course. This long par 5 can be significantly shortened if you shoot your ball down the big hill right in the middle of it. For long hitters, losing sight of a powerful tee-ball down that hill can be a quite exhilarating feeling. Since the fairway is somewhat wide and only separated from adjacent holes by smallish trees, it can also seem safe to try to bomb it out as far as possible. But not so fast, there’s still potential danger that looms over that mysterious hole. Imagine your surprise after you get to the other side of the hill and never find your ball even though you hit it right in the heart of the fairway. Nothing apparent could explain it: there’s no bunker, no tree, no rough, no water hazard, nothing! Your ball could not have plugged because it rolled down the hill… So what happened? The answer is simple: you were the latest victim of the infamous thieves’ guild! In this case, a band of groundhogs that steal balls and bring them into their hole, or holes we rather should say. And no, this is not considered a hole-in-one! The only practical solution to that problem is to send one member of the group on top of the hill while others hit. The groundhogs are too scare to do their thing when a human is around or at least, a screaming human. Sometimes, a shorter hitter that isn’t able to reach the hill can even hit his drive first and immediately get there to allow longer hitters to hit without fear of losing their ball. In tournaments, that hill can be a great spot to appoint a fore caddie. Laws prevent us from hunting these protected animals, maybe they could still eventually be moved. The other hole of interest for this chronicle is another par 5, the 17th hole at my home course. After a somewhat generous driving area on that long hole, you are faced with a precise second shot to a narrow fairway surrounded by trees that slightly bends right. On the left side, a private forest starts about 30 yards from the edge of the fairway. About 200 yards in, a series of undulations prevents you to exactly know where your ball stops even though you often can see it bounce thru the small hills. From time to time, even convinced your ball ended up in a safe place, you would never find it, as if it mysteriously vanished in the gentle waves in the fairway. In this case, a clever fox was the perpetrator. It would sneak under the cover provided by hills and trees to add to its egg collection. If you were lucky, especially on calm mornings or late just before dawn, you could have a peak at this graceful yet very shy creature. Be careful, it looks cute and friendly but it’s still a wild animal after all. On two separate occasions, our group found a pile of balls accumulated by that fox. The first time, in the woods to the left and in a clearing beyond the green after that. Worried about its proximity to humans and possible transmission of rabies, the authorities eventually moved the fox elsewhere. 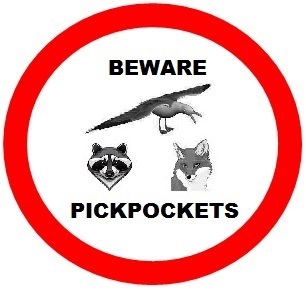 With some retrospect, maybe our two featured holes are much more alike than we initially thought as out of sight burgling animals seem to prefer par 5s related to lucky number 7. Another incident associated with 7 is quite notorious as it happened right in front of thousands of spectators on probably the most famous hole in golf: Island Green 17th at TPC Sawgrass. Who knows, maybe a more in-your-face approach is permitted on par 3s? Even if it’s not necessarily a common occurrence, everyone seems to have a story involving animals interfering with their golf ball. But when it happens, do golfers really know how the properly deal with the situation? Let’s have a look at what the rules say about all this. When you see an animal touching a golf ball, there’s 3 main plausible relevant applicable rules scenarios. The animal deflects or stops the ball; it picks up a ball at rest or finally; it picks up a ball in motion. We already covered the first possibility in our previous Bird Crossing Chronicle. The rules just tell you «tough luck» if your ball is deflected or stopped by an animal. Thus, you would have to play your next shot as it lies in that unfortunate circumstance except for a stroke from the green that is cancelled. For the second possibility, a ball at rest picked up or moved by an animal would simply have to be replaced. 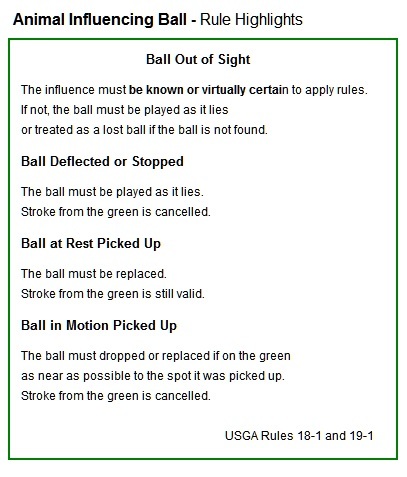 A previous stroke from the green is still valid because the ball was at rest before it was influenced by the animal. The ball must be replace as near as possible to the spot it was picked up. On a side note, it isn’t relevant if the animal is at rest or not. The last probable possibility is a ball in motion picked up by an animal. The procedure is relatively similar but the ball must generally be dropped with the exception of a ball picked up on the green like in the «Island Green incident» presented above that must be replaced. Again, a stroke from the green would be cancelled. The rules stipulate it must be known or virtually certain that the animal influenced the ball and that fact is an essential condition to apply the previously mentioned elements of the rules. If that important condition is not met, the ball has to be played as it lies. And subsequently, if the ball is not found, the «tough luck» stipulations apply again and the ball must be treated as a lost ball. In most cases, a player would then have to hit another ball (from the same spot of his previous shot) and incur the commonly used stroke and distance penalty. Ouch! To determine if a free drop is still a possibility, all facts must be taken into account and attenuating circumstances can be considered. For instance, in our groundhogs story, a case could probably easily be made to take a drop without penalty because it is known that groundhogs steal balls on that hole and it is almost certain the ball ended up in the fairway. There is no other possible explanation for losing the ball: no present bunker, tree, hazard, etc. Other factors could also help your case like if you see the ball bounce over the hill in the fairway or if animals are present although you don’t actually see them with your ball. And maybe golfers from another group witnessed the crime. But remember, when in doubt, you’ll have to consider your ball lost and swallow the stroke and distance penalty, even though you may think it can be a little severe in the circumstances. In our fox story, the case to take a free drop seems much more difficult to make. Because the fairway is narrow and turns, it is very difficult to determine where the ball ended up. The ball could have been deflected by tree limbs or even be lost in long rough or a hollow. Maybe you could still present a winning case if for instance, you saw your ball bounce in the fairway and then, saw the fox cross the fairway in the exact same vicinity. Ultimately, the best way to prove your case is to actually find the ball. Having people around also helps a lot. In a tournament, rules officials, marshals or fore caddies may be a necessity to avoid unfortunate and potentially unfair situations. PGA Tour professionals don’t really have that kind of problem because spectators and even cameras are there to witness most of their probable animal interactions. Once it has been determined with certainty, a ball must be dropped or replaced (depending on circumstances) as close as possible to the spot where the animal picked up the ball. If the estimated spot is out of sight, the selected spot must represent the average expected lie. To give an explicit example: a player that sees a dog run far away with his ball after hitting it in a hollow where fairway, light rough and heavy rough are present, would have to drop another ball without penalty in light rough. Exception: Ball striking person attending or holding up flagstick or anything carried by him - see Rule 17-3b. (iii) on the putting green, the ball must be placed on that spot. (b) after a stroke on the putting green, the stroke is canceled. The ball must be replaced and replayed. Q.A ball played from off the green was about a foot from the hole and still in motion when it was moved by a dog to a spot about ten feet from the hole. The ball was either deflected by the dog or the dog picked it up, ran with it and dropped it. What is the ruling? A.If the ball was deflected, it would be played as it lay, without penalty, from the spot to which it was moved by the dog (Rule 19-1). If the dog picked up the ball, the player should have placed the ball, without penalty, as near as possible to the spot where the original ball was when the dog picked it up (Rule 19-1a). Q.A player makes a stroke on the putting green and, while the ball is still in motion, it is picked up and carried away, or is deflected, by a dog. What is the ruling?